There's one common component between Android and iOS development when creating a hybrid app and that's the Visualforce page. This ability to code it once and use it multiple places was repeatedly touted at Dreamforce '11 and '12. This post will briefly go over the creation of such a page as well as the creation of a Connected App. 4) Jump back over to your IDE, right-click on your "src" folder and click on "Refresh" to pick up the new files. 5) Save the Static Resource to the server by right-clicking on your "src" folder within the project explorer, going to "Force.com" and clicking on "Save to Server." 6) Now create a new Visualforce page by right-clicking on your project --> New -- > Visualforce Page. Give it a name and click on the "Finish" button. 7) Below is how I've structured my page. Take note of the different div data-role's. Although I'm only creating one Visualforce page, my final product will have four different "screens" (Main, About CRM Science, Ami, and Kirk). CRM Science is a full service Salesforce consultancy with extensive expertise in building CRM and native Force.com applications. We concentrate on Salesforce.com projects that improve relationship management, enhance business workflows, and integrate external systems. 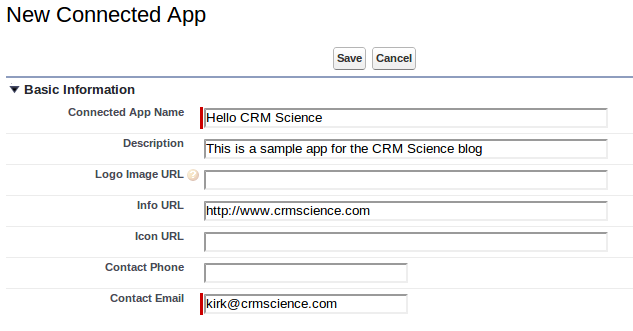 CRM Science is lead by Ami Assayag, and takes on SFDC projects for one to four developers/administrators. I am a seasoned entrepreneur and CRM specialist who spent many years architecting enterprise CRM applications, both proprietary and on existing CRM platforms. I spent several years developing a proprietary SaaS CRM solution for the alternative asset management market, which was built exclusively on Force.com. The solution offered a single portal through which both investors and investments can be managed, and information can be easily collected and disseminated. The solution is now part of a full service fund management firm. I co-founded a venture backed CRM solution for individuals and small businesses that provided value throughout their sales and business development processes by incorporating networking activities, social infusion, intelligence, and workflow into traditional CRM. I also served as an Entrepreneur in Residence at an east coast venture fund exploring the CRM space. Kirk is an experienced Salesforce.com developer, having spent the past few years supporting a Philadelphia 100 and Inc. 5000 firm in the retirement space. While serving as a key employee in the company's IT department, Kirk spent much of his time developing the many custom solutions that tie employees, external proprietary systems, and Salesforce.com together, making the Force.com platform an integral keystone in the company's success. Now that we have the page, it's time to create a "Connected App" within our Salesforce org. Again, a "Connected App" is defined as an app that leverages the Identity and Data APIs to connect to Salesforce. If you're familiar with "Remote Apps," Connected Apps are meant to be an updated replacement, including additional features giving you the power to limit who can use the app and which security policies are used by the app. After the app is created, we'll also receive our Consumer Key and Secret values that are used when creating the hybrid app in Xcode or Eclipse. Configuring a custom app is a straightforward process. First you define the OAuth metadata with details like the app name, description, callback URL, operational IP range (optional), as well as info about enforceable mobile policies (also optional). 1) Navigate to Setup --> App Setup --> Create --> Apps and click on the "New" button within the "Connected Apps" section. 2) Provide the "Basic Information" for your app. 3) Next, define the details for the API Integration. For the Callback URL, I've defined "testsfdc:///mobilesdk/detect/oauth/done" and selected the "Access your basic information" OAuth scope. 4) Click on the "Save" button and you'll be taken to your new Connected App's record. Notice the Version, Status, Consumer Key, and Consumer Secret fields. Now you're ready to begin your hybrid app "development." In the upcoming posts, you'll see how to configure your dev environments (Xcode or Eclipse) and how to use the Salesforce Mobile SDK to take advantage of the power of your Visualforce page.